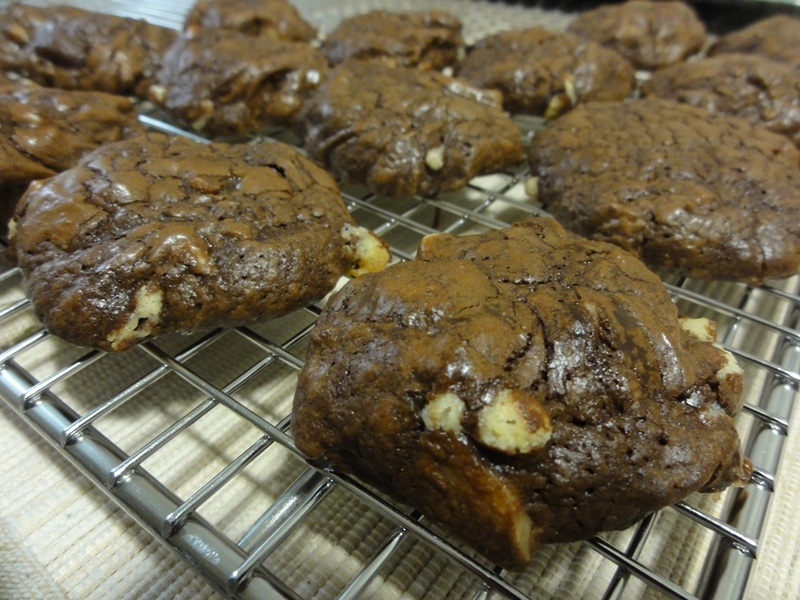 Back in April when I made the Double Chocolate Walnut Cookies from the “Best of Fine Cooking – Chocolate” 2006 edition of Fine Cooking magazine it occurred to me that those cookies would make a really good white chocolate and macadamia nut cookie. That quasi-tropical combination is one I’m always fond of but at the time I didn’t have white chocolate chips or macadamia nuts on hand. When I went shopping for ingredients for this month’s White Chocolate Apricot Macadamia Cookies I bought a few too many of both white chocolate chips and macadamia nuts and so the obvious thing to do was make some double chocolate macadamia cookies! 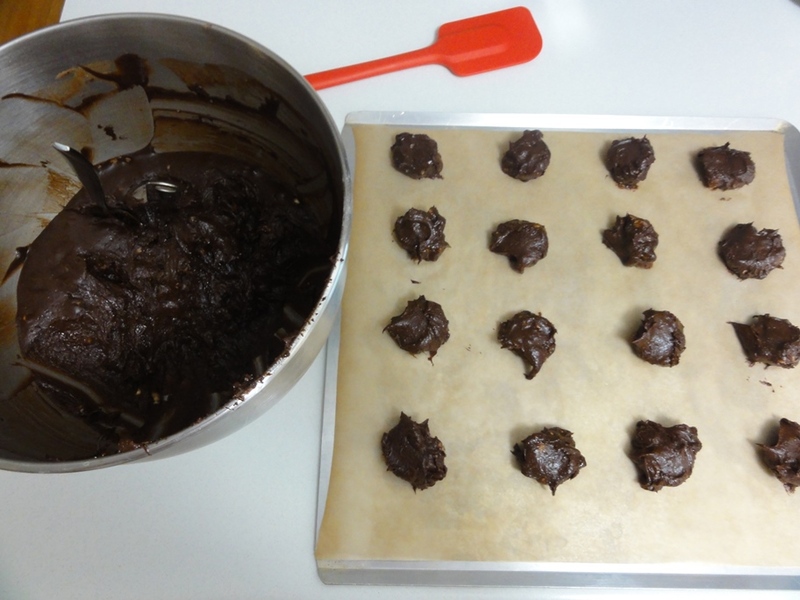 Given how happy I was with the Double Chocolate Walnut Cookies I was not surprised to be delighted with this slight modification to that recipe. 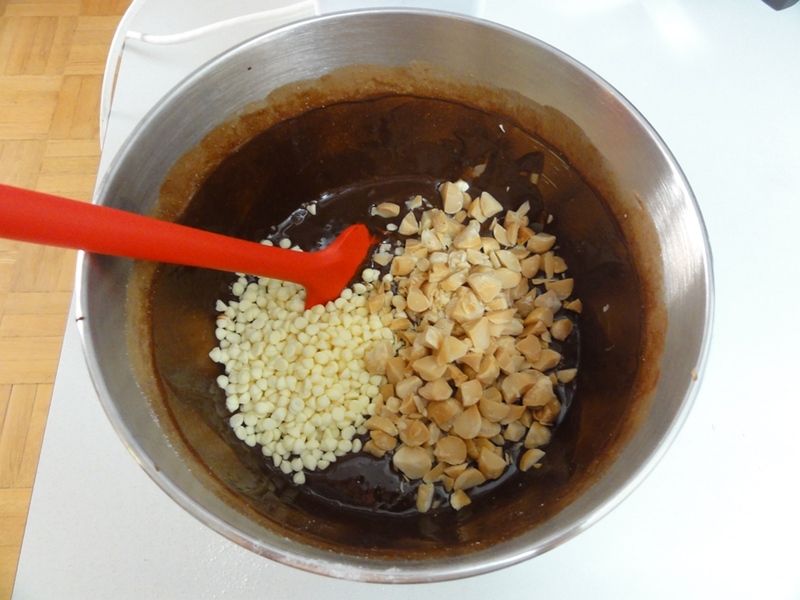 The chocolate cookie base is fairly strong so the flavor of the white chocolate doesn’t always come through, usually it’s more of a hint, so it might be worth upping the quantity of chocolate chips depending on your preference for white chocolate. Aside from changing the chocolate chips and nuts I also added what has swiftly become a staple for making soft cookies; a tablespoon of cornstarch. One thing I noticed from the White Chocolate Apricot Macadamia Cookies is that macadamia nuts seem to benefit from a couple of minutes longer in the oven when being toasted so I adjusted that time as well. The recipe below is otherwise a copy-and-paste from the first attempt. 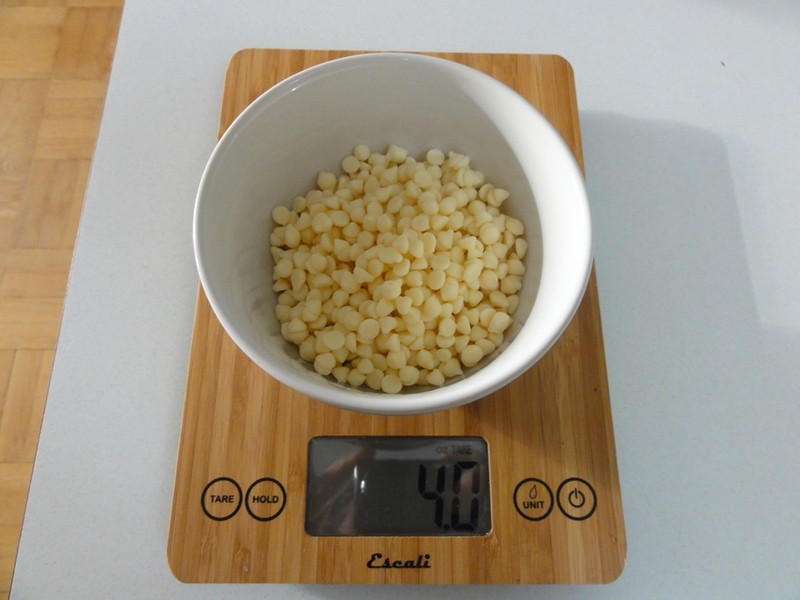 Toast the macadamia nuts on parchment paper on a baking sheet for 7-8 minutes at 350°F. Melt the butter in a saucepan over low temperature. 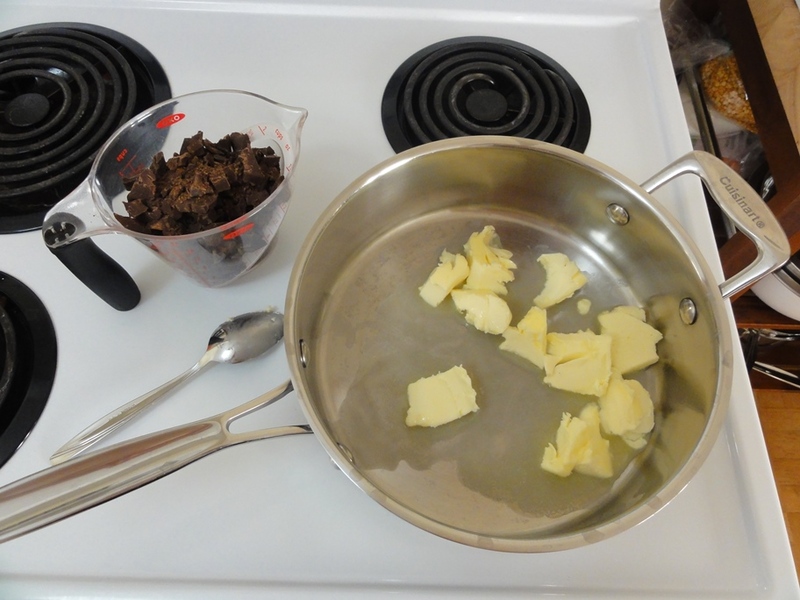 As soon as the butter is evenly melted, toss in the 5 oz. of unsweetened and 4 oz. of bittersweet chopped chocolate. 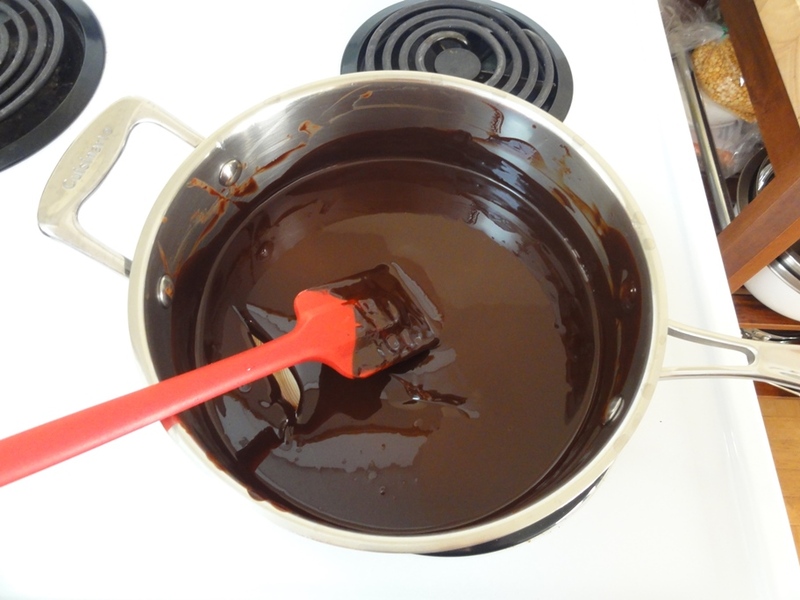 Stir the chocolate continuously until melted and smooth, and then set it aside to cool. 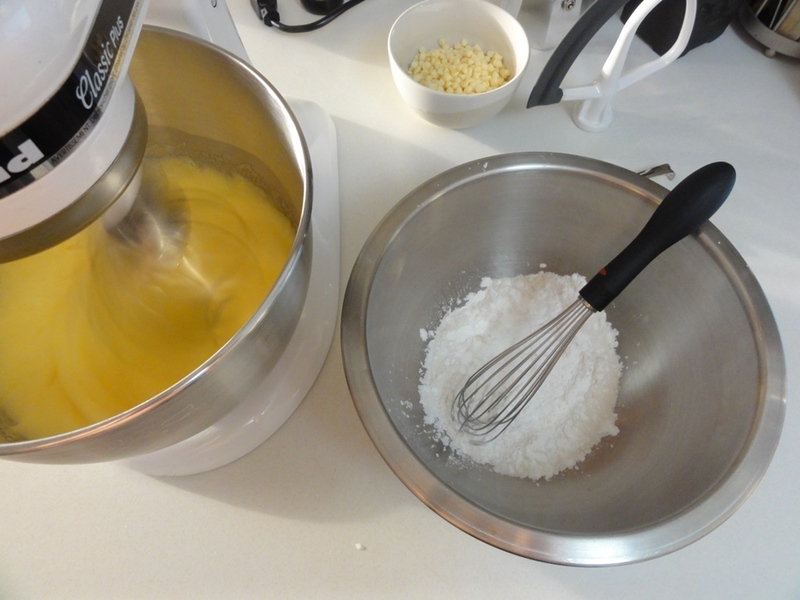 Using a stand mixer with the whisk attachment on medium-high speed, whip the eggs and sugar until thick and light; about 10 minutes. Add the melted chocolate mixture and vanilla and blend on low speed until the batter is an even color. Whisk together the flour, cornstarch, baking powder, and salt and add the dry ingredients to the wet. Fold in the 4 oz. of chocolate chips and the macadamia nuts. Refrigerate the dough until it has firmed up enough to scoop; about 60-90 minutes. Pre-heat the oven to 350°F. Restrain yourself from eating the cookie dough straight. Drop the chilled dough in even tablespoonfuls about 2 inches apart on prepared baking sheets. Bake for 13-15 minutes. They should come out cracked on top and feel dry on the surface but still a little springy if you press lightly on them. Let the cookies cool on the sheet for a minute or two before transferring them to a rack to cool. If you’re wondering what the spiky thing is in the following photograph it’s a Mrs. Anderson’s Baking Chocolate Chipper. I learned about this glorious kitchen implement courtesy of Page Strong at P.S. I Love Chocolate when I noticed it in a photo and inquired both about the slab of Callebaut chocolate and the double-trident being used to chop it up. This recipe was the first time I had a chance to use my chocolate chipper and in short: it’s amazing. It beats the pants off trying to carve up a large block of chocolate with the edge of a knife because it doesn’t slide all over the place and risk shaving off a bit of your finger. 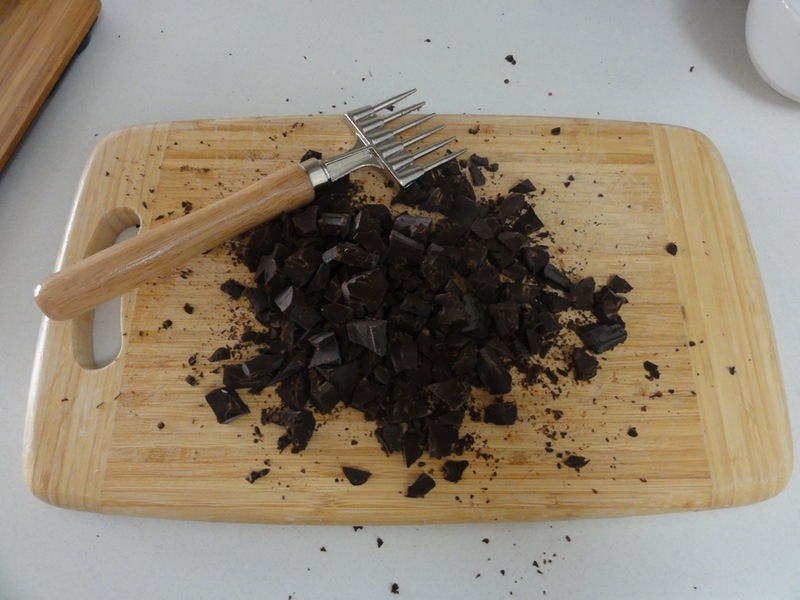 The chipper stays stable as you stab away and easily carves up the chocolate into chunks small enough to easily melt. I generally try to avoid uni-tasker kitchen implements for wont of space in my kitchen (and I’m not likely to need to chip up some ice anytime soon, which is about all else I can figure this being used for) but for anyone who even occasionally ends up hacking away at a block of chocolate with a knife I highly recommend the Chocolate Chipper as a more efficient alternative. P.S. : it’s also fun to stab at chocolate with a double-trident. 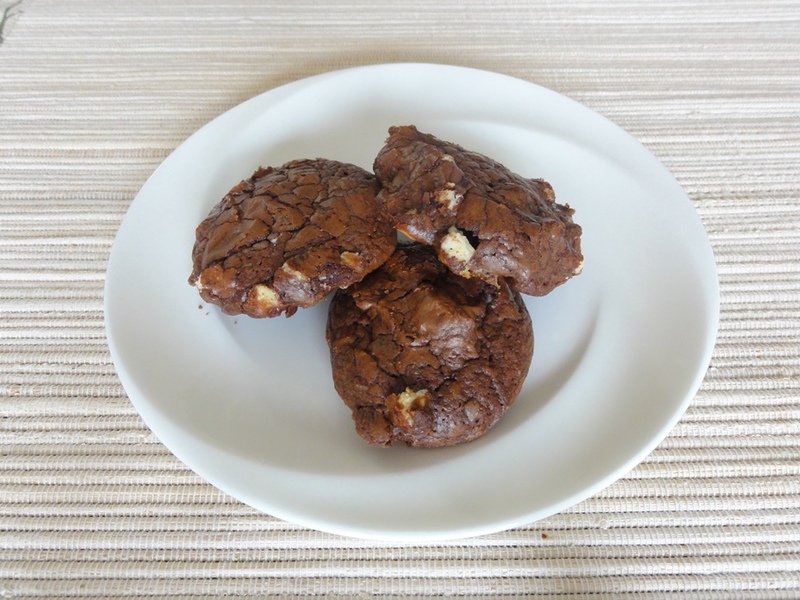 The step-by-step photos from the Double Chocolate Walnut Cookies recipe will do the trick for these cookies as well if you want to double-check how your batter or cookies look as you go along. Instead, for this modified recipe, I’m just going to throw out some random photos I took. Of course I can’t leave you without the requisite “Three Cookies on a Plate”, which I could follow-up shortly thereafter with the photo “A Couple of Crumbs on a Plate”.